Which markets should you target if you're building a smart home startup? Until recently, a smart home was considered something of a luxury: pricy and not very frequently adopted by middle-class households. This situation is changing rapidly and experts forecast a drastic growth in the home automation market globally over the next two-three years. Our team at CLAP has performed extensive market research and has undertaken interviews and polls in Europe, Asia, and the US, and now we want to share the results with you. The US was the first country to enter the global smart home market and is still a leader in the demand for, and penetration of, home automation. Nowadays, around 32% of American households are equipped with home automation systems, and the amount of users is expected to hit 53.1% by 2022. Americans care about anything that can improve their comfort: managing light, curtains, audiosystems, climate. The smart home is considered a form of entertainment. The classic American dream paints a picture of wealth and spending as a way of life. In my opinion, that is why Americans are less concentrated on saving money on utility bills, compared to Europeans. Another reason is that utilities here don’t cost much when compared to the average salary. For example, a monthly utility bill for an apartment of 85m² in New York is $160, and the Big Apple is one of the most expensive cities in the country. Low prices for utilities do not motivate people to save money: in the depths of winter when it is snowing outside, many Americans still wear T-shirts and shorts at home because it is so hot indoors. In Europe, on the other hand, most of the home automation projects target resource saving, both financial and natural. One might argue that such a focus is based both on the European mentality and on the economic climate in the EU. Scandinavian countries were the first to discover the automation of natural resource consumption. In these countries, energy is sourced from water – from thermal springs and water tides. The Scandinavians are pioneers in the development of alternative sources of energy, which is one of the reasons why they have embraced the smart home as a way to save natural resources. In Austria, Germany and Switzerland, the smart home is a way to save money: in these countries prudence in cultivated. People take every opportunity to cut costs on utility bills for heating, electricity, etc. The utilities for an 85m² flat are around $250 a month. 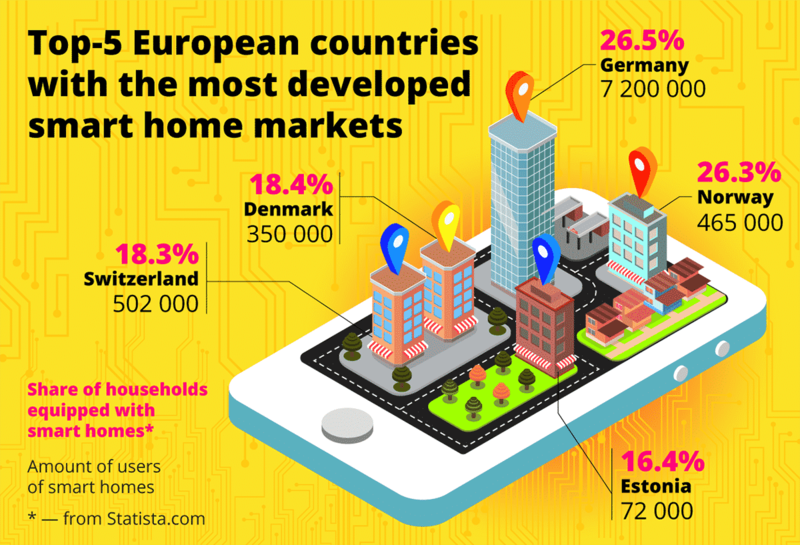 In Southern European countries like Portugal, Spain, and Italy, people are less interested in smart home automation than their Northern neighbours. The net average salary in Portugal, for example, is $950, compared to $2,500 in Germany and $6,300 in Switzerland. The standards of living here are lower, and while people are interested in saving, they are unable to afford smart automation systems. People in Southern Europe tend to save as much as possible on heating, usually just managing without it in winter. For example, in Portugal the temperature in winter can descend to 5°C (41° F) out in the street and 10°C (50° F) in the apartments, but still the residents would rather put on more pullovers than spend money on extra heating or heat-saving windows. In countries that used to be part of the USSR, like Russia, Ukraine, or Kazakhstan, security is the first priority, as a result of the political and economic situation. Nonetheless, people do still want to save money, as utility bills are growing from month to month. The main problem here is that 80-90% of residential houses are very old. They have obsolete meters installed, and it is quite hard to customize smart home systems to them. Also it is worth taking into consideration the fact that in most of the post-soviet countries, there are very few middle-class citizens. For example, in Kazakhstan, a vast land the size of 20% of Europe or 25% of the USA in square meters, it is only worth promoting smart automation systems in the two biggest cities – Astana and Almaty. Unfortunately, in the country’s other cities, the number of people who can afford a smart home is very low. That is why the residents of this region don’t care about saving money through home automation – those who can afford a smart home are rich. The leading country in consumption of smart automation ideas today is United Arab Emirates. Usually people there are interested in climate control. Because of the high temperature outside, almost all life in UAE takes place in air conditioned environments: even their transport stops are air conditioned. That is why it is important to automate all the temperature regimes so that people feel comfortable. At the same time, people in UAE don’t need to worry about security systems, as the level of safety is very high. They often don’t even lock their cars at night. But because they pay quite a lot for utility bills – around $196 a month for an 85 square meter flat – they care about saving. 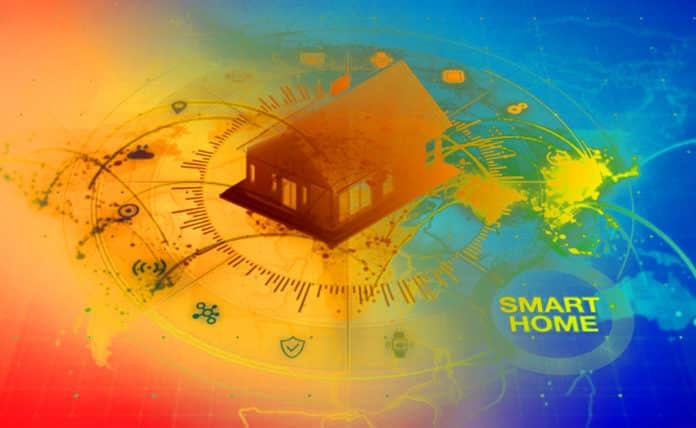 Other Asian countries like Japan, Malaysia, Singapore and South Korea, are also showing interest in smart homes as part of a general involvement in tech innovation. Have you heard of Japanese toilets? They can do almost everything, from singing a special greeting, to warming up the seat, and even testing the results of your visit to give dietary recommendations! As a first priority we have chosen the USA, UK, and German-speaking countries as regions where home automation is the most developed. These regions will also see fast growth in smart home automation markets in the next couple of years. We will also target Ukraine and the neighbouring countries, where there is not yet a home automation system that is adapted to the local reality.